Avon Tyrrell has a variety of bike tracks and trails within the 65 acre grounds making Mountain Biking an exciting and challenging session. We can tailor Mountain Biking sessions accordingly and help you improve techniques, learn new skills, improve your bike control or just enjoy mountain biking under the guidance of our qualified instructors. Closed toe shoes are recommended for this activity, although we do not recommend wellies or crocs. It is helpful for us to know beforehand if any participant is unable to ride a bike. We also require the heights of the riders to ensure we have the correct sized bikes available. Our Blue Route has been designed for all-abilities and is suitable for our fleet of accessible bikes and wheelchairs. The Red Route is technically more challenging aimed towards intermediate and expert riders. Session content will be led by your requirements, but also by the experience of your whole group. Advanced areas of our trails such as the Northshore (with challenging obstacles and jumps) and our Pump and Gravity Track are only suitable for experienced riders. Skill: Aimed at those already able to ride a bike, our Mountain Bike sessions look to use existing skills and knowledge as a foundation for advanced skill acquisition. Personal Challenge & Achievement: Whether riding around our accessible tracks suitable for all levels, or tackling some of more advanced tracks, riders will have the opportunity to find levels of personal challenge and explore their own personal achievements. Fitness & Wellbeing: Mountain bike sessions by their nature are physically demanding and promote the benefits of personal fitness and its importance for mental, emotional, social and physical wellbeing. Incorporated as part of a programme of outdoor learning adventure activities such as mountain biking can improve group and leader familiarisation as individuals work closely together, often leading to raised levels of attainment and the promotion of personal characteristics such as self-belief, perseverance and confidence. As well as being adapted to suit your group and their specific learning objectives, Mountain Biking can support key areas of the curriculum. Bike Hire: We also have bikes available for hire for use on or off site. Booking is recommended. Track Membership: Whether you are looking to use our tracks as a one off, or would like a year long pass, membership cards can be purchased from our main reception. Memberships are instant so you can hit the tracks straight away, however to use the advanced sections of our track a pre-booked induction is required. 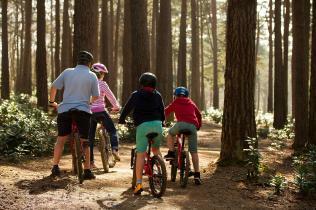 Hire a bike and hit the tracks or go out and explore the New Forest. We have Red and Blue trails for beginners and our Pump and Gravity and North Shore Park elements for the more advanced rider.